BariteWorld offers a large range of industrial minerals used in many industries, and in stock at locations throughout North America. The specification sheet for each chemical is available upon request. We guarantee reliability, quality and competitive pricing. Bellow see list of industrial minerals we sell. 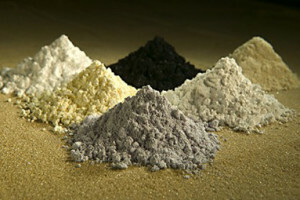 If the minerals you are looking for are not listed – we will source it out for you. Any application, Any industry, Any Quantity. From stock or directly from mines. INDUSTRIAL MINERALS LIST THAT WE SUPPLIES. Most of the minerals we offer are available in multiple grades, quantities, packages and sources. Quantities vary from industrial and technical to high purity and fit for human consumption. Packages vary from pails, paper bags, fiber drums, FIBC bulk bag to bulk. Grades can be lump, granular, powder, slurry or micron sized. Many goods arte sold with lot numbers traceable to the original production and meeting ISO 9000 standards and with Certificates of Analysis conforming to USP, FDA or bacteria free.